Feni is branded as the country liquor which is native and unique to the state of Goa and hence cannot be found anywhere outside Goa.Sattari a small town in the province of Goa is the real fenny capital of the state. 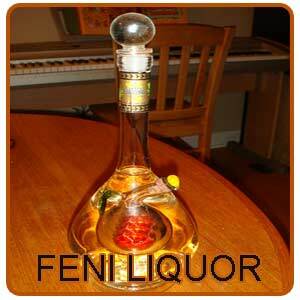 The name "feni" is derived from the Sanskrit word phena which actually means froth or foam. Feni is compared with froth because of the bubbles that form a light froth when the liquor is shaken in a bottle or when poured into a glass. Coconut or the juice of the cashew apple forms the main source of this country liquor feni. History states that it was the feni made from coconut was initially consumed and later the people started using the same technique for distilling the tropical cashew fruit. -Due to the excess of coconut palms in the coastline of Goa, the same was used in the making of feni but later with the invasion of the Portuguese to India along with the exotic variety of cashew tree, soon feni was also started to be produced from cashew apple fruit. But still it is not clear when and who started distilling fermented juice into a spirit. The alcohol content is quite high where it falls between 43-45% and those which are available in the market for commercial purpose has an alcohol content of about 42.8% of alcohol. The small batch distillation of feni has a basic effect on its final character; still retaining some of the delicate aromatics, congeners and flavor elements of the juice from which it was produced. As a thumb rule, the aroma is indicative of a carefully crafted feni. -The high percentage of alcohol in feni has the power of making a person get drunk in no time. So it is generally preferred to be get along with aerated drinks like Coca-Cola, tonic water and lemonade. But if one really want to have the fun of getting high then it can be enjoyed on its own on the rocks, or with a slice of lime. 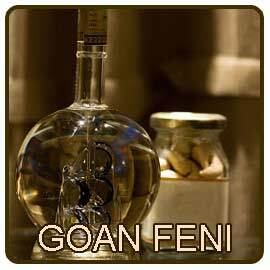 The feni of Goa is a symbol just like products of Russian vodka, whiskey, French cognac or Greek ouzo. Feni is not considered as a forbidden drink for it enjoys the protection of the enactment of origin. Because of its statute the drink of feni is quite freely used at all levels in all the resorts and the brand of the state can be advertised everywhere. It has the right to be consumed even in a coffee shop or a restaurant and sometimes is also purchased as a souvenir from a native bootlegger. -The quality of feni is graded based on its aroma for a genuine quality of feni can be identified even at a quite long distance by its unique smell when feni is distilled. The process undergoes three steps of distillation of which the feni got from the third distillation is supposed to be noted for its genuine and outstanding quality. Because of the multifaceted feature of feni it can be very well enjoyed with a cocktail too. People visiting Goa never miss to enjoy this intoxicating drink just to have the fun of it. Feni is pure in its form, ice-cold, hot or in cocktails. Though the production of feni has now become much commercialized there are still people who follow the traditional way of distilling the drink and the bulk produced by this method is mostly sold without any labels to retailers and home consumers. -But with lot of innovations and commercialization in this field the product produced is being purchased by the bottlers who have developed their own brand like 'Cashyo' , 'Reals' (pronounced as Reaals), and 'Big Boss'. Sattari one of the feni capitals of the state, according to the Baseline Survey of the Feni Industry tops and leads the area under cashew. It is not really very heavy like other drinks for the heat generated by this drink is enjoyed to its maximum with the cool breeze of the sea. The coconut feni is produced throughout the year but however there is a decline in the coconut feni production because tapping is very labor intensive and is not an appealing profession. 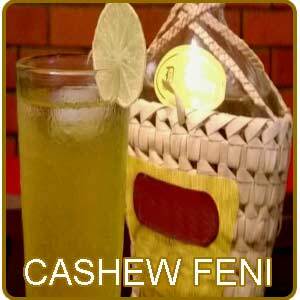 Cashew feni is more seasonal between the months of late February to mid- May for it depends on the fruiting season. -Feny is available in almost all the shops in Goa however the main area being the shops in and around Panaji.Some famous names in the trade are Royal Kajuwala in Panaji, Ajanta Industries in Ponda, Saima Agro Industry in Usgao and Zantyes Cashew Nuts in Panaji.The intoxicating local Indian liquor, feni is prepared either from coconut or from the juice of the cashew apple. Among the feni prepared from coconut and cashew apple fruit, the feni of the latter is preferred more among the people than the former mainly because of its flavor. Cashew apple when it undergoes the process of distillation results in the aromatic and spicy cashew feni whereas the coconut feni is got by the toddy tapped from the coconut trees by the toddy tappers. Coconut feni is also preferred by some people. -The preparation of this exciting drink is not as easy as manufacturing other drinks for it involves quite a laborious process. The first step involved in the process of manufacturing cashew feni is crushing of the cashew apples manually in a coimbi which is a rock on the hill carved or shaped like a basin with an outlet to let the juice flow down. There is a huge earthen or copper pot buried in the ground known as kodem to mainly collect the juice got from the crushing of the cashew apple. These earthen pots with the collected juice are then made to boil on firewood. The juice in the pot undergoes various steps of vaporization and distillation till a concentrated liquid is obtained in smaller pots. This concentrated liquid is continuously blended with cold water with a help of a wooden ladle only to keep the pressure under control. Once the process of distillation is over we can get the aroma of the feni in the air. The distillation process involves three steps of which the first product got from distillation is urrac which is very light and diluted and goes well with some lemon or orange juice. The second product is known as Cazulo and is not common in the local markets. Cazulo is to an extent strong which makes you gulp or greedily drink based on the resistance of one's alimentary tract. Finally the end product of distillation is feni which has nearly 42% of alcohol with full strength. North Goa is more into cashew apple feni whereas the southern part of Goa has more of coconut palms and hence they are more into the manufacture of coconut feni which is not as in demand as the cashew feni. -Feni when ordered in a shop is generally served in a coconut shell. As we enjoy this country liquor we should also realize the hard work and dedication put into this manufacture. While a bottle of Feni costs anywhere between Rs 75 � Rs 800 depending upon its purity, the prices could raise many folds with the GI certification while also streamlining the process for brewing the brand.The Geographical Indication (GI) was granted only to the Cashew feni in 2009 and not to coconut feni. The GI features cashew feni as a colorless, clear liquid that when matured in wooden barrels develops golden brown tint. The effort in getting GI for cashew fen was mainly achieved by the Goa Cashew Feni Distillers & Bottlers Association and the Department of Science, Technology & Environment of the Government of Goa. -Feni has got the status of Geographical Indication (GI) which confirms and states the unique geographical origin of the drink. The government of Goa was very keen on creating a brand for feni and turn it into a drink of international repute similar to that of other popular drinks like Mexican Tequila and European Snapps. Thus with GI, feni has a got an enhancement of local poor man's liquor to exotic drink. The registration of GI in respect to a product gives exclusive right to the proprietor for its use and protects him from an act of unfair competition against deceptively similar goods. Now feni is available in markets packed in bottles of innumerable sizes, shapes and colours.The labels on these bottles give a brief history about the drink. -Those which are available in the market come with a handcrafted basket just as a memory for the visitors good times in Goa. Feni bottles are mostly carried as souvenirs by the travelers and hence there is a slow market developing for this country drink even in other countries like USA, Middle East, Europe, Australia and Canada. Some of the manufacturers of feni distillers are trying to add the health benefits of this product so as to increase the market for this drink and make it as a truly international drink. The main challenge faced by the manufacturers of feni drink is to educate people into the art of drinking Feni. The jarring fragrance can even deter a first timer with its sharper flavour.The manufacturers are also trying to highlight the low calorie content and its medicinal properties like good appetizer, an antidote for cough and cold so as to improve the sales of the product. -Though Feni has been produced in Goa for more than four centuries the manufacturers still face a lot of problem. There are nearly 4000 distillers in the state who are into the manufacturing of feni where nearly 70% is brewed only for home consumption and the rest 30% goes for the commercial purposes like to bars and wholesalers. Mostly only traditional method is followed for brewing which results in differences in consistency. So the industry has now requested the government to lay-down a standardized process, which can be made a bench-mark for those looking to export the drink to international market. The bench mark includes squashing the fruits by a fruit crusher, etc.While efforts are on to bring all brewers into one umbrella organization, it is a tough task given that most families learnt to brew Feni from their fore-fathers.